Serendipity, it’s an unexpected discovery, a pleasant surprise. And perhaps it was something truly serendipitous that made me stumble, or rather, fall head over heels for The PepTides. I first learned about this band while researching one of the band members for a website I was writing new content for (for my day job). 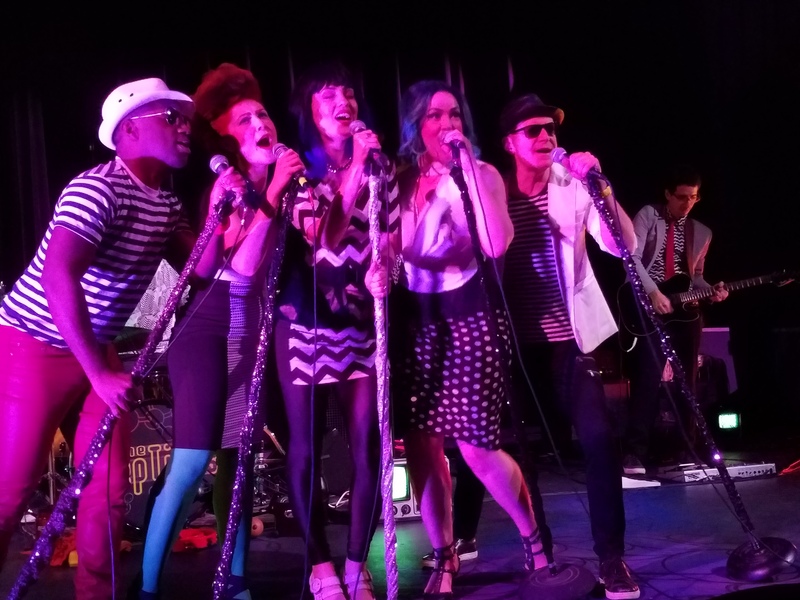 I learned that The PepTides are a nine-member, Ottawa, Ontario-based funk-electronic-disco-pop-rock party band that have played a number of shows around Canada, did an album with The Vinyl Cafe’s Stuart McLean and have a loyal cult following around the city and beyond. Wow…yeah I know, right? Eclectic in all forms of the word, and that is certainly a good thing! Visually, the nine-members (five vocalists and four instrumentalists) dressed largely in black and white with flashes of colour here and there, (red pants or green tights or red ties a yellow hat ribbon) are a sight to be seen and especially heard. 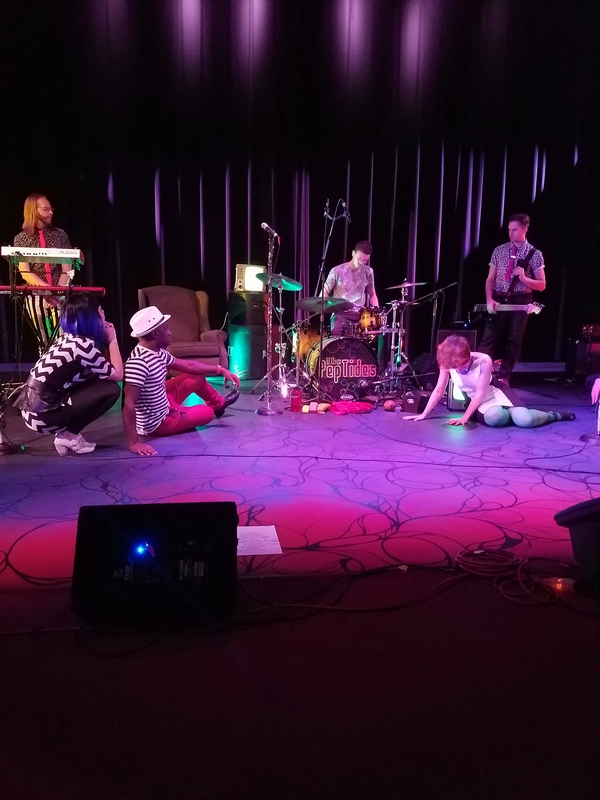 With an array of coordinated dance moves, neon hair and some props it became quite clear, very early in their performance (okay, from their very first song) that this is more than just a group of musicians having fun. When DeeDee Butters, Claude Marquis, Olexandra Pruchnicky, Rebecca Noelle and Dale Waterman walked onto the stage acting like robots I knew right away that this was going to be an amazing show. Opening with ‘Homme Love Whore’, its quick and punchy lyrics and fun beat brought the robot act to life. Following the opener was ‘Don’t Believe in Love’, the infectious track that got me hooked on the band originally, from their 2016 eponymous 6-track release. ‘The Enemy’ and ‘For Those Who Hate Human Interaction’ were next, two rare tracks from the ‘I’m in Love’ single. ‘Love Question Mark’ the title track from their 2014 release was followed by ‘Attack of the Treadmill’ arguably my favourite song from the show (Billy Joel’s ‘We Didn’t Start the Fire’ comes to mind). Some of my other favourite moments from the show include the band sitting around drummer Alex Wickham’s kit while he played a drum solo or Scott Irving’s engaging keyboards throughout the show; or Juan Miguel Gomez Montant’s catchy guitar riffs or just how serious Andrew Burns was throughout the performance – an interesting juxtaposition from Olexandra’s infectious smiles and explosive energy. The use of props (razors, deodorant, hairspray etc.) for Olexandra’s fun ‘For Those Who Hate to Shave and Shower for a Date’ was also very well done and worth mentioning. For me, Rebecca Noelle’s vocals were just the icing on the cake, and if I was standing she would surely have made me weak in the knees. Between Rebecca, DeeDee, Olexandra, Dale and Claude, their vocals and harmonies were unlike anything I have heard before in a live show, and I’ve seen over 500 shows in my day! The band closed the show with ‘I’m In Love’ and ‘Love Live Get High’ two great tracks (you need to listen to the album versions of each for full appreciation). The energy from the show still resonates with me the next day and will for a long time. The show brought back memories of seeing Canadian Indie rockers Stars in their earlier years or Mother Mother at the Jane Bond in Waterloo, Ontario when they were first touring promoting their debut album. The Jane Bond show was incredible because the Jane Bond is so small and intimate – probably a couple hundred square feet. The energy, enthusiasm and just sheer joy Mother Mother were able to convey almost blew the roof off the tiny place and has stayed with me almost ten years later; this is how I feel about The PepTides show last night. I can’t remember the last time I had that much fun at a concert and this was a fairly subdued show given thr seriousness of the other performances. That being said, I wont have to wait long to get my dancing shoes on as The PepTides are playing the House of Targ on Saturday February 4! Special guests Les Petits Fours will be opening the show. Tickets are $10 in advance, $12 at the door and available here. Sometimes great music finds you when you aren’t even looking for it and I can honestly say that I wasnt looking for The PepTides but I am really glad I found them! If you are looking for a great list of songs you probably haven’t heard yet check out and follow the RefinedGeekery.com 2017 Playlist on Spotify as I’ll be adding more songs every month. Comments are always welcome. Ottawa has a reputation for being boring, quiet and obviously a government town, and for the most part it is sadly true, but those who say that have never experienced a PepTides show. 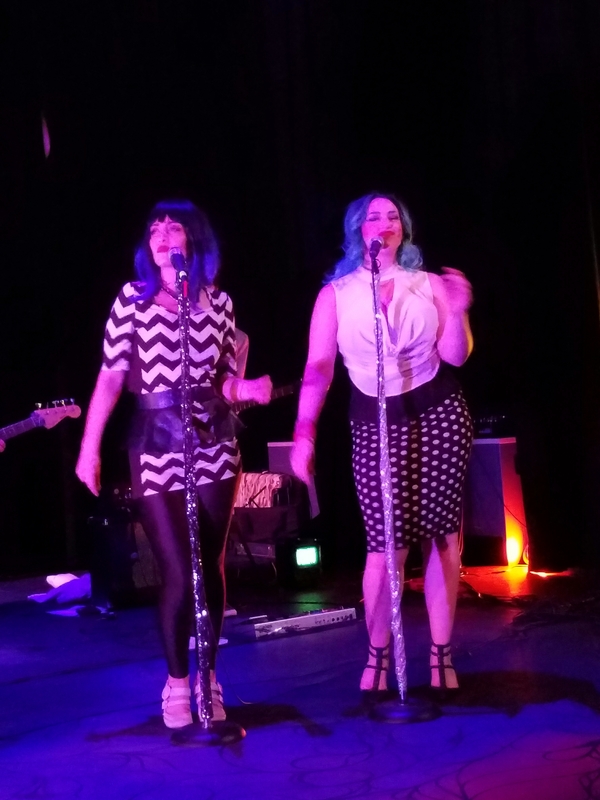 The PepTides are a high-impact, kick you in the face rollercoaster of fun. My advice to anyone who goes to see them is buckle up and get ready for a wildly entertaining ride! See you at House of Targ!